Whenever a new religious faith was proclaimed, its art reflected the feelings of the population. Such a change took place when the Islamic faith was brought through Egypt, Syria and Persia. The Moorish kings constructed wonderful buildings in Spain between the 9th and 14th centuries. You’ll find Mohammedan ornamentation in its highest splendor at the Cathedral at Cordova, the Alhambra in Granada and in the Alcazar in Seville. 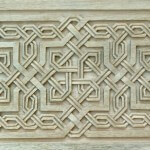 Moorish carvers had extraordinary talent, evidenced within the interweaving of geometric and arabesque decoration. 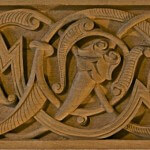 The carving is clever and distinct and it never confuses the eye. Beautiful arabic lettering was often integrated into the decoration. The Saracens came from Northern Arabia. Like the Moors, they were standard bearers of Islamic art. When Sicily was defeated by the Normans, the Saracens worked with the Christians. In fact, many churches were decorated by Mohammedan carvers and artists. Having defeated Mesopotamia, Syria and Asia Minor, the Seljuk Turks in Constantinople developed an early style of Islamic decoration that developed into what we now recognize as Ottoman. Some of their earlier buildings date from the mid-12th century. One example is the Medresseh at Erzeroum, which features pointed arches and carved capitals decorated with stalactites. Persian Islamic art’s most characteristic feature is its richly-colored glazed tile, which you’ll see good examples in the architecture of the ancient Caliphate in Bagdad and Isfahan. Generally, it’s not as geometric as Moorish and Saracenic decoration. Persian Art reached its peak around the end of the 19th century. When Islam arrived in India in the 12th century, it already found exceptionally elaborate carving and art. The decoration blossomed reached its highest glory in the 16th century and often showed stylized plants rather than the geometric style preferred by the Moors. The restrictions laid down by some Hadiths that animals not be depicted was often disregarded both in Indian and Persian art. 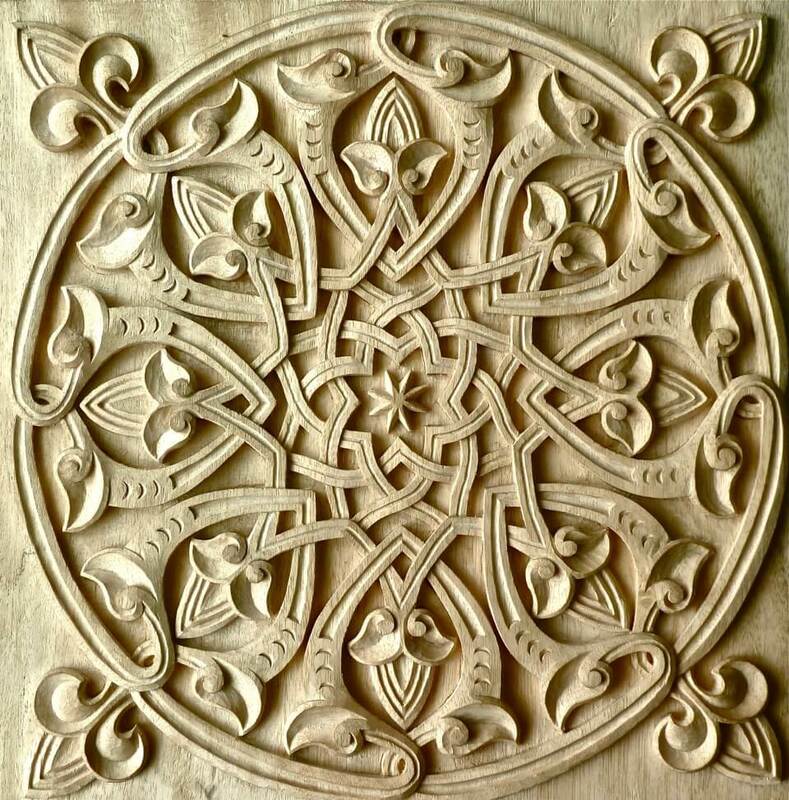 Islamic-style woodcarving based on a 13th-century design. 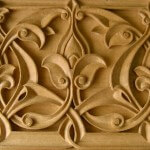 Islamic-style woodcarving based on a design from the Mosque-Madrassa of Sultan Hassan in Cairo. 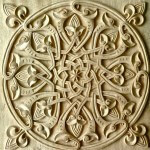 Islamic-style woodcarving based on a 14th-century Moorish design.